The cast take part in a 10 question quiz. I believe the experiment is in seeing how similar their answers can be which affects the prize. Also if someone's answer does not match with anyone else, they receive a batsu punishment from one of the backstage guests (drawn at random). 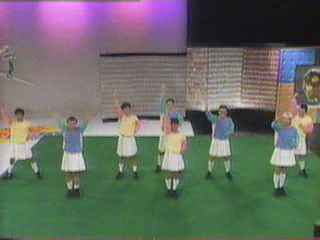 With the cheerleading team for the Nihon Phoenix (日大フェニックス) football team and instructors 池田和美 (Kazumi Ikeda) & 大木五郎 (Ooki Goro), the cast in skirts form a cheerleading team with dances and stunts. Last edited by soudou on 09.10.2014, 14:31, edited 1 time in total. Can you upload this file again? In addition, please upload other kazaana ep files again? Oh dear, I must of missed that earlier message, so sorry katayu. And yes sure Fengson. I actually really need to just upload the whole of Downtown Kazaana and Downtown Juice onto MEGA so it'll be permanently available. Still swamped with work. But hopefully I get time to do that soon Happy people are interested!